For many publishing houses, “going digital” can mean a lot of investment. Based on your unique market needs you may need to seek expert advice and discuss with an e-to-e digital service provider to enhance your customer’s digital experience at optimized cost. We are convinced that we could partner with you for all your digital as well as print needs in whatever stage of readiness that you may be. Come visit us at the fair to know more about how you could benefit from our customized service offerings. 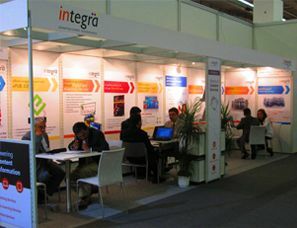 Integra will be exhibiting at Digital Book World 2012. Come visit us at our stand to understand how we can add value to your digital programs. The Frankfurt Book Fair is the biggest book and media fair in the world – with around 7,400 exhibitors from over 100 countries. This is the place to network, build bridges into future and make new discoveries. Integra, founded in 1994, is one of the leading publishing services company in the world. We provide end-to-end content management and content transformation services for publishers worldwide and are positioned among the top six publishing services company in India. Headquartered in Pondicherry, we provide services for many of the top 20 global publishers and are expanding our presence across North America, Europe, and Asia-Pacific. Employing 1100+ publishing professionals at a primary delivery center in Pondicherry and at wholly owned subsidiaries in the US (Chicago and New York) and in the UK, we strive to deliver beyond customer expectations.